TWENTY years have passed with today marking the moment when Ginger Spice left the Spice Girls at the height of the group's success. With reports of catfights and claws, this is the story of what really happened, from the girl's own mouths. Victoria Beckham was in London when she received the call from the Spice Girls' lawyer, Andrew Thompson. She thought it was a joke. "No, this is serious, Victoria. Geri is leaving the band. She's had enough. She doesn't want to come back". It was May 26, 1998. The Spice Girls, then the biggest girl band of all time, were at the tail end of their European tour and had flown out of Helsinki to launch the midweek Lottery in the UK. Scary, Baby, Ginger, Posh and Sporty were set to take the stage the next evening in Oslo and the American leg of the tour was due to start in just a couple of weeks in Miami. Geri had already warned the girls a couple of months earlier, while in Milan in March, of her plans to depart the band. She sat the girls down in a dressing room when she announced her decision to leave at the end of the world tour, notably after the Spice Girls' scheduled performance at Wembley Stadium that September. Geri was met with silence from the rest of the group. "Why do you want to leave?" Victoria asked, according to Halliwell's 1999 autobiography, If Only. "I've had enough," Geri replied. By this stage the Spice Girls' insane schedule had taken a toll and Geri's eating disorders had returned at full force. Her life, she felt, was spiralling out of control. Over the next two months, Ginger had began to slowly lose some of her colour. Her outfits less daring, her hair a shade or two lighter. Her blonde streaks removed. Less make up. Layer upon layer unravelling before the public's eye. She knew she wanted to get off the rollercoaster. She said the girls had begun to squabble and that "things were far from perfect". "One thing that was clear at the time I decided to leave was that inside Ginger Spice, underneath the make-up, the big hair, the giant platforms and the headline-grabbing dresses, there was a real girl and she was being suffocated," Halliwell wrote in her second autobiography, 2002's Just For The Record. Lawyers had been informed and the four remaining girls began to grow closer, Geri thought. The wheels for a departure were in motion. The Spice Girls in happier times perform on stage at the Brit Awards in London on February 24, 1997, where they scooped awards for Best British Video and Best Single. On the flight home to London to launch the Lottery in May, the girls were in good spirits. "It was one of those mad flights we sometimes had, with loads of shouting and laughter and messing around. Geri seemed fine - we all did," Melanie B wrote in her autobiography, Catch A Fire. The girls hugged, said "See you tomorrow" - and that was it. But then, all hell was let loose in Spice world - a snap decision that would throw the plan into disarray and would leave the girls gobsmacked. That morning, Geri had discovered a "heavyweight" breast cancer interview that she had scheduled had been cancelled despite The Sun running a front page piece headlined: "Ginger Spice secret breast cancer op". For Geri, it was a particularly sensitive issue. She was keen to use her fame for higher purposes and felt this an ample opportunity after she had emergency surgery on a small lump in her breast at the age of 17. Despite her negative result, she was desperate to highlight the issue and felt it was a chance to send out a positive message to check your breasts. "Although some might think it was just a slogan or a gimmick, I had always been serious about Girl Power," she wrote. "Unfortunately, the girls made it clear that they would rather I waited until after I left in September. The answer was obvious - it was time for me to go." Devastated that she couldn't do the interview, it was breaking point for Ginger Spice. "Forget the rest of the European tour," she wrote in her diary that night. "Forget America! Forget Wembley Stadium! Ginger Spice is no more. She has left the band." After the call from the Spice Girls' lawyer, Victoria's reaction was to simply ignore it. "I literally no idea," she wrote in her 2001 autobiography, Learning to Fly. "If anybody had taken a picture of me at that moment, it would not have been a pretty sight. A monkey's bum would have been more attractive." But the issue couldn't be ignored forever. Melanie B, Victoria, Melanie C and Emma frantically tried to reach Geri, and found her hiding out at her brother's house. The four girls all phoned and attempted to convince her to return, telling her "we've come this far" and "what on earth are you playing at?" One by one they tried, with no luck. Geri said there was simply nothing left to say. That night the girls had the scheduled Lottery appearance, but they weren't ready to tell the world of the inner turmoil raining down in Spice world. Geri's sickness became the "scapegoat" for the story; there was still hope that Ginger could eventually return, the remaining four still thought she would eventually see some sense. So, throwing on a smile for the cameras, what would become the "fab four" made their first appearance sans Geri. "Unfortunately Geri's not very well tonight so get well soon Geri!" Mel C spoke for the group. The official Virgin line was: "Geri is suffering from nervous exhaustion". After the Lottery gig the remaining four flew to Oslo, but on their way Geri had been spotted boarding a plane to France. "People recognised me at the airport, but nobody realised I was making my escape," Geri wrote. By the time she had flown out, questions were being asked. Geri wasn't sick at all and the media could sniff a story. She hadn't been seen publicly since her performance with the Spice Girls in Helsinki. "Everyone had their theories," wrote Victoria. "That there had been some great row on the flight back from Helsinki. That we'd been hitting each other. The truth is that we'd all really had a laugh on that flight back." Despite Geri saying the she had prepared the girls for the inevitable, Victoria says differently. "Perhaps she thought we were mind readers," Victoria wrote. "We didn't know. Why she said that I have no idea; perhaps because it made her look better, because otherwise it was like admitting she had left us in the lurch. Which, of course, was exactly what she did. Geri Halliwell had left us totally in the lurch." There wasn't much time to think - the Spice Girls had a show the next day and there was rearranging to do. The four remaining Spice Girls had less than 24-hours to completely rechoreograph and sort out new vocals to all their songs. "It was mad. We didn't have a spare moment to absorb what had happened. We just had to get on with things," Mel B wrote. Melanie C was particularly nervous about covering Geri's famous lines in Wannabe. "It was more strange than difficult, especially doing the opening lines with Melanie," Mel B wrote. "She would sing the words, whereas they were meant to be shouted." For Victoria, there was "one big plus. For the first time ever I got to sing on Wannabe". But it didn't make up for the "total betrayal" she felt. "I'd known Geri for four years, we'd shared a room in Windsor (before they were famous), we'd been through the most extraordinary experiences of our lives together. She was one of my best friends. And now she had walked out without a word. What I felt was anger at the selfishness of it all, then betrayal," Victoria wrote. But the public was still completely unaware, despite the press reports. "Spice Girls face split as Geri stays away," read a headline in the Daily Express. Sky News was running bulletins about "Missing Ginger Spice". This is a message to the fans. Sadly, I would like to confirm that I have left the Spice Girls. This is because of differences between us. I am sure the group will continue to be successful and I wish them all the best. I have no immediate plans. I wish to apologise to all the fans and to thank them and every one who has been there. The press statement issued by Freud Communications Agency for former Spice Girls member Geri Halliwell. A £500,000 ($AU883,000) price tag was offered for the first shots of Geri sans Spice life. She wrote in her diary the next day: "Things are going crazy. Everybody is looking for me. I can't possibly hide forever. But where can I go? I don't feel safe here any more. They're going to find me." She received a call from Ken Berry, the boss of Virgin Records, telling her George Michael had offered her a safe haven to stay and ride out the storm. "I felt as though an angel had been sent down to me. In my hour of need, he came to my rescue," Geri wrote. She flew to St Tropez where George assured her: "Don't rush, Geri. Take your time. You have longer than you think before the attention goes away." In later years Geri would eventually describe the breast cancer interview was "only part of the picture" and "deep down in my heart of hearts I know that the disagreement about the interview was a life raft I used to get out of the group". "Inside my heart, though, I'm not proud of leaving when I did. I'm not proud about that at all," she wrote. Italian tenor Luciano Pavarotti (L) performs with the Spice Girls just over a week after Geri’s departure on June 9, 1998. Pavarotti had attempted to bring Geri back for the performance, but she declined. Victoria reflected: "Geri really had been under much more strain than the rest of us, it was always harder for her, the only Spice Girl who wasn't a trained dancer. "It's not easy getting up there on stage night after night, six days a week. 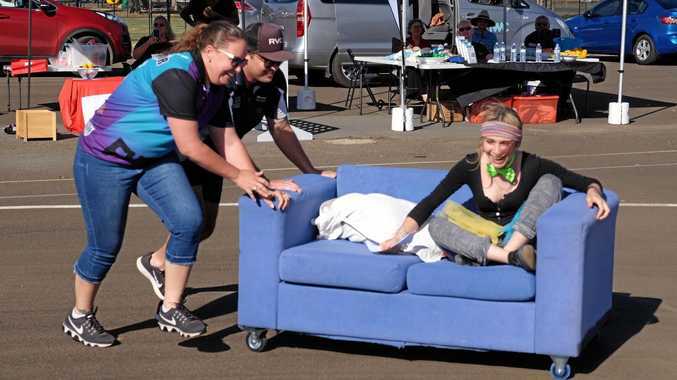 Despite all the extra classes and rehearsals, she still found the pace of doing show after show more difficult to cope with than the rest of us. "And she did get criticised for it, and it's horrible when people say you're the one with no talent, which they did. And I should know." At the end of the year, the Spice Girls were back on top of the Christmas chart with their single Goodbye. "It felt as if they were singing it to me," Geri wrote. But "without Ginger to hide behind, I wasn't really sure who Geri was any more". 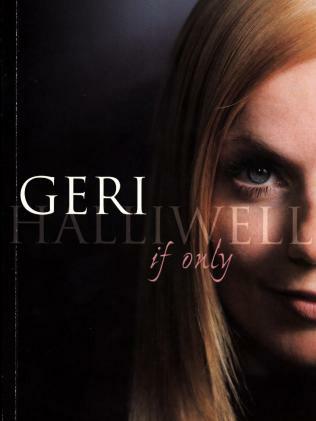 Cover of Geri Halliwell's autobiography, If Only. Victoria Beckham with autobiography, Learning to Fly. In January 1998 the Spice Girls flew in on a whirlwind tour of Sydney to promote their movie Spice World. Geri is pictured reaching out to fans who crush for a glimpse before they enter the State Theatre. Picture: Brad Newman.